Computer Space – The co-inventor of Computer Space, Nolan Bushnell, saw the commercial potential of Space War when he played a version of it while a student at the University of Utah in the 1960s. With his business partner, Ted Dabney, Bushnell built his own version in Dabney’s daughter’s bedroom (she had to sleep in the living room). Computer Space was not a great success, but Bushnell and Dabney would co-found the company Atari and go on to greater things. Magnavox Odyssey - The first commercially available games console built by Ralph Baer. It took several years and a few stalled attempts for Baer to find a commercial backer for his Brown Box device. Eventually the US Television company Magnavox became interested. Unfortunately due to poor marketing the console did not sell as well as was hoped. Pong - The first arcade game for Nolan Bushnell and Ted Dabney’s new company Atari. Pong was a computerized version of Ralph Baer’s ping pong game (Baer later successfully sued). An early omen of the game’s huge future success occurred when a prototype cabinet was installed in a local bar. A few hours later the bar manager rang Atari to report a fault with the machine. Morale in the company sank until it was discovered that it had stopped working because the coin box was full to overflowing. 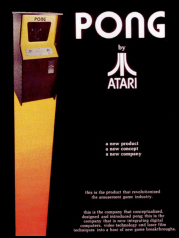 Pong went on to make $3 million (£1.5 million) for Atari. Maze War – A hugely influential game originally written by Steve Colley, a computer programmer working at NASA. 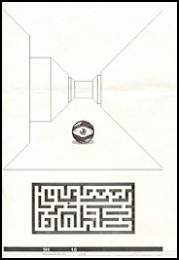 In Maze War, multiple players wandered around a maze shooting at other players who appeared in the form of eye balls. The various versions of Maze War created over the years have been credited with originating many videogame conventions, such as first-person perspective, avatars (game characters who are controlled by the player), and networked play.